April 4, 2019- As warm weather approaches and temperatures begin to rise higher, it’s time to start thinking about outdoor dining and drinking! We’ve rounded up some of Philly’s favorite outdoor options in and around the city for those looking to soak up the sun while enjoying delicious dishes and drinks. From Center City staples, to Old City hang-outs, to Southern-inspired hot spots, there’s a place for every outdoor enthusiast. A Mano, three-bell Italian BYOB from Townsend Wentz Restaurant Group, has put its tables and chairs out for the season. Guests can enjoy rotating seasonal takes on classic Italian dishes from Executive Chef Michael Millon, such as Parsley Cavatelli ($16), Burrata ($15), and Duck Breast ($36), while taking in the views from the corner of 23rd St. and Fairmount Ave. Keep a look out for the latest spring menu additions — coming soon. Assembly Rooftop Lounge offers Philadelphians sweeping views of the Benjamin Franklin Parkway, Philadelphia Art Museum and Center City from nine stories above Logan Square. Guests can dine and imbibe al fresco this season with and a frosé or craft cocktail in hand while enjoying unrivaled views of Philadelphia. Starting Monday, April 22nd, Assembly will be open 4 pm-close every day. Bluebird Distilling, the award-winning grain-to-glass craft distillery in historic Phoenixville, invites imbibers to enjoy its outdoor patio flanking bustling Bridge St. this season. Guests are encouraged to BYO food from one of Phoenixville’s many restaurants, grab a craft cocktail from Bluebird Distilling’s bar, and snag a seat outside. For those looking to escape the bustle of Center City, or those already living in the suburbs, Bluebird Distilling is an ideal location to enjoy an afternoon or evening outside with a beverage in hand. CO-OP Restaurant and Lounge, University City’s lively bar and restaurant located on the bustling corner of 33rd and Chestnut, offers patrons a fresh perspective on city dining with its open-air seating on Chestnut St. When the temperature rises, so do the glass garage doors, creating an inviting outdoor space lined with blossoming planters, where everyone can enjoy a seasonal cocktail and delicious brunch, lunch, or dinner. J. Alexander’s, the new contemporary American restaurant in King of Prussia, invites guests to enjoy a drink or bite on its stunning outdoor patio before or after a meal and during happy hour from 4-7 pm Monday-Friday. Guests can grab their favorite cocktail, wine, or beer at the bar and head out to enjoy warm spring days with friends and family. MilkBoy, Philadelphia’s dynamic duo of restaurants, bars, and live music venues, invites imbibers and foodies alike to enjoy outdoor seating at both the Chestnut St. and South St. locations. Perched on the corner of two bustling intersections, guests can enjoy a cocktail, pint of beer and some snacks while watching the world go by. Philadelphia Brewing Company, one of Philly’s oldest and largest brewing companies, recently launched its fully operational Peacock Room Bar and Beer Garden. Guests can enjoy a flagship Kenzinger or a crisp and refreshing Commonwealth Cider in the beer garden or beautiful cobblestone courtyard while enjoying the sunshine. Food trucks roll up to the outdoor space intermittently throughout the season. Red Owl Tavern, located across the street from Independence Mall, boasts expansive al fresco seating in addition to an outdoor bar for imbibers. Guests can enjoy a vast selection of brown spirits and craft cocktails by Lead Bartender Kyle Darrow and elevated American tavern fare, including Crab & Corn Fritters, Fried Artichokes, Berkshire Pork Chop, with historic views of Independence Hall. Stay tuned for spring menu updates, coming soon! Rex 1516, Philly’s go-to for elevated Southern-inspired cuisine, offers guests outdoor seating on South Street with an array of mouthwatering Southern fare. Guests can enjoy delicious dishes, such as the Fried Green Tomatoes, Crawfish Pot Pie, Mussels, Fried Chicken, and St. Louis Style Spare Ribs, while enjoying a craft cocktail and the fresh air. For those looking for a new brunch spot, guests can pull up a seat at one of Rex 1516’s coveted outdoor tables for the über-popular Shrimp & Grits or Chicken & Waffles Benedict. Royal Boucherie, Old City’s lively American brasserie from award-winning chef Nicholas Elmi, is opening its verdant upstairs deck on warm, sunny April days with an official opening slated for May 1. Hungry imbibers can stop by for lunch during the week and enjoy a $2 martini on the deck, or stop by for happy hour from 5 to 7pm and soak up the last sun rays of the day while noshing on snacks such as Pork-Stuffed Fried Olives ($3.50). For those looking to dine al fresco in Center City, Square 1682, located steps from Rittenhouse Square, offers outdoor seating on Sansom St. Guests can stop by for innovative craft cocktails and appetizers such as Truffle Fries and Duck Wings, while soaking in the sun. 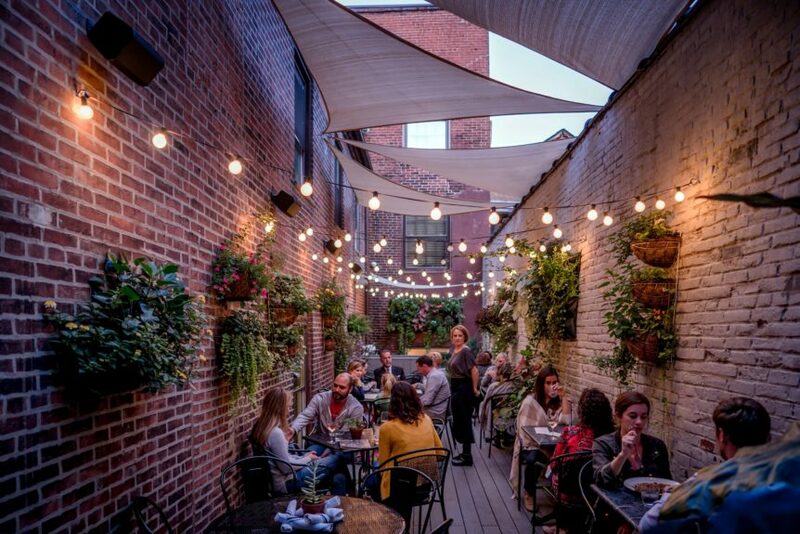 Perfect for a post-work beverage or a late evening meal, Square 1682’s patio offers guests a front row seat to one of Philadelphia’s liveliest intersections. The Bourse, Old City’s newly opened historic food hall, has set up its all-day outdoor seating on its patio across the street from Independence Mall. With food and drink options such as Filipino fare from Lalo, drafts from Taps Fill Station, and made-from-scratch tacos from Rebel Taco, guests can enjoy a world of flavors in the shadows of history. The Twisted Tail, Society Hill’s vibrant bar, restaurant and live music venue, serves up Southern-inspired contemporary American cuisine at the many umbrella’d tables flanking Headhouse Square during warm weather. Guests can enjoy outdoor dining and Southern-inspired dishes and beverages while taking in the sights and sunshine. Known for their brown spirits selection, imbibers can settle in for a bourbon or whiskey flight while enjoying a delicious meal off the charcoal grill. Urban Farmer, the modern American steakhouse located on Logan Square, has generous outdoor seating along the Benjamin Franklin Parkway, where patrons can spend a Sunday morning building a Bloody Mary ($16) or an early weekday dinner enjoying happy hour specials, such as Urban Farmer Beef Sliders ($5). While guests dine and imbibe, they are treated to a striking view of one of Philadelphia’s most beautiful parks.